Anleu Fernández's message was posted with the tag "#escandalogt," identifying it as part of an ongoing discussion on the scandal that broke on Monday when a video recorded by assassinated Guatemalan attorney Rodrigo Rosenberg was distributed at Rosenberg's funeral and posted to the Internet. In the video, recorded days before he was shot while riding his bicycle in Guatemala City, Rosenberg accuses President of Guatemala Álvaro Colom of complicity in his death. Rosenberg also accused President Colom of responsibility for the April murder of Rosenberg's client, Khalil Musa, alleging that Musa was killed because he refused to cooperate in corrupt business deals operating within the structure of Banrural, a partly state-run bank. Musa had been appointed by President Colom to the board of Banrural. 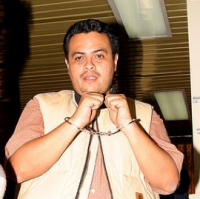 Anleu Fernández was arrested according to a law which specifies fines of Q5,000-Q50,000 Guatemalan quetzales (about $600-$6,000 U.S. dollars) and 1-3 years of prison for those who "elaborate, divulge or reproduce in any media or communication system, false or inexact information which harms the confidence of customers, users, depositors or investors"((Translated from Spanish)) of an institution under the jurisdiction of the Superintendent of Banks. Prosecutor Genaro Pacheco told journalists that Anleu Fernández admitted to sending the message in question.